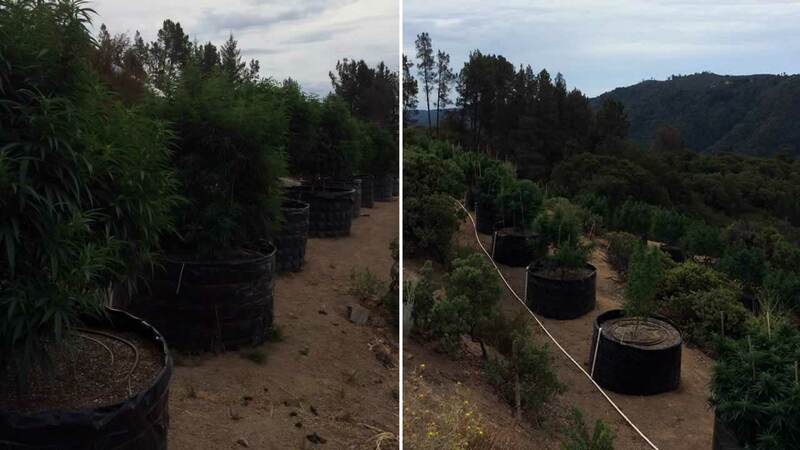 SANTA CLARA CO., Calif. -- A raid at an illegal marijuana grow in the Santa Cruz Mountains Thursday morning led to the discovery of hundreds of plants valued at about $1.7 million, a Santa Clara County sheriff's spokesman said. Around 7 a.m., deputies executed a search warrant at a private, rural property on Loma Chiquita Road near Loma Prieta Road, sheriff's Sgt. James Jensen said. Five men were detained at the scene, Jensen said. Deputies found about 850 plants along with cash and ammunition, he said. Investigators had been conducting surveillance on the property and received citizen complaints of the illegal site, according to Jensen. The plants were growing outside and also inside greenhouses at the property, Jensen said. Deputies also found three to four tents that people at the property were living in and growing materials including bags of fertilizer, he said. People at the property claimed they were growing medical marijuana, but the number of plants violated county ordinance and state law, according to Jensen. Personnel from the county's Department of Planning and Development were called to the site because of illegal buildings at the property, he said. Thursday's raid is part of the county's effort to eradicate illegal marijuana sites. So far this year, deputies have seized 32,380 plants valued at $65 million, 161 pounds of processed marijuana worth $325,000, a shotgun and two handguns, Jensen said. The sheriff's office has also made 12 arrests and found a butane honey oil lab, Jensen said.